Blue Origin test fires a powerful new hydrogen- and oxygen-fueled American rocket engine at the company's West Texas facility. The secretive private spaceflight company Blue Origin founded by billionaire Amazon.com CEO Jeff Bezos has successfully test-fired a new engine for commercial rockets that may one day help launch astronauts and cargo into orbit, NASA officials said today (Dec. 3). A video of the recent rocket firing provides a rare peek at the company's work in progress. Little is publicly known about the space vehicles being developed by Blue Origin, which is based in Kent, Wash., and was founded by Jeff Bezos in 2000. 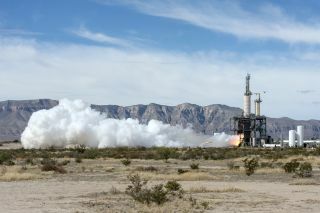 Blue Origin test fires a powerful new hydrogen- and oxygen-fueled American rocket engine at the company's West Texas facility. Blue Origin's Orbital Launch Vehicle will use the BE-3 engine to propel the company's Space Vehicle into orbit. During the test, Blue Origin's so-called BE-3 engine was fired at full power for two and a half minutes to mimic a launch, producing 110,000 pounds of thrust. After the initial burn, the hydrogen- and oxygen-fueled engine stopped for about four minutes to simulate a coast through space before a short final burn. This last firing tested the systems intended to bring the booster back for a controlled vertical landing. Guiding the rocket back to the ground safely would allow it to be refurbished and used again for another mission. The BE-3 engine will also be incorporated into Blue Origin's planned Orbital Launch Vehicle, a rocket that will loft the company's cone-shaped Space Vehicle into orbit. That spacecraft could eventually carry astronauts to the International Space Station, NASA officials said. Blue Origin is a partner in NASA's Commercial Crew Program, along with other private companies like SpaceX and Sierra Nevada Corp. The program aims to help the aerospace industry develop systems to ferry astronauts to the space station. With the retirement of NASA's space shuttle fleet in 2011, the United States currently relies on Russian Soyuz vehicles to bring astronauts to the orbiting outpost. "Working with NASA accelerated our BE-3 development by over a year in preparation for flight testing on our New Shepard suborbital system and ultimately on vehicles carrying humans to low-Earth orbit," Rob Meyerson, president and program manager of Blue Origin, said in a statement. "The BE-3 is a versatile, low-cost hydrogen engine applicable to NASA and commercial missions." Phil McAlister, NASA's director of commercial spaceflight development, added that Blue Origin has made steady progress since the start of its partnership with the space agency. "We're thrilled to see another successful BE-3 engine test fire," McAlister said in a statement. According to NASA, the BE-3 is the first new liquid-hydrogen rocket engine to be built for production since Aerojet Rocketdyne's RS-68 was developed for the Delta IV rocket family more than 10 years ago.